My nephew and I have been spending a couple of hours each day doing some school work. It's tough to get him to focus on the exercises, but I downloaded Sebran's ABC software to teach him Afrikaans and for us to increase his vocabulary. The software was new to him, and he was curious, so we had fun. For Lifeskills, we had a short chat about his strengths, and it was weird hearing a 7-year old say he doesn't have any strengths.He was very surprised when we came up with a list of personality strengths and he could identify some them as qualities he does have. 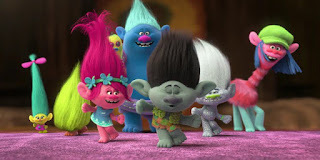 We spent the rest of the morning watching the movie Trolls, and singing and dancing to the soundtrack. The music is nostalgic and fun and the plot is very interesting. I wish I could write just as well.